Flexibility in where, when and how you work – including remote work – leads to innovation, as well as communication, creativity, productivity and engagement, according to new national research from the Flex+Strategy Group (FSG). This is among the key findings from a national probability telephone survey of 595 full-time employed adults conducted for FSG by ORC International. The results suggest major corporations including IBM may have gotten it wrong when they cited remote work as a barrier to innovation and collaboration and asked employees to re-locate back to company offices. The research also found a significant lack of training required for successful flexibility. Of those who do work flexibly, 45 percent feel that flexibility increases their ability to “communicate, create and innovate with colleagues.” Only 5 percent report a decrease, with 49 percent saying it remains the same. 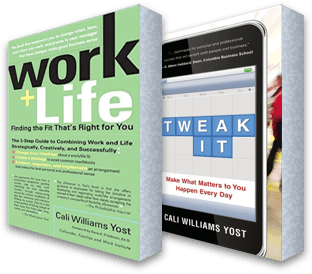 Further, 60 percent who have flexible work options feel they’re “more productive and engaged.” Only 4 percent said they are less so, with 34 percent feeling their level of productivity and engagement is consistent. Remote workers also noted the same performance benefits. Among remote workers, 41 percent feel their flexibility increases communication, creativity and innovation, with only 4 percent reporting a decline. A majority also feels more productive and engaged (58%), with only 2 percent saying they are less so. More than three-quarters (76%) of all respondents feel advancements in workplace technology have made it easier to team up with and communicate with colleagues, and 58 percent said it has made it easier to work flexibly. 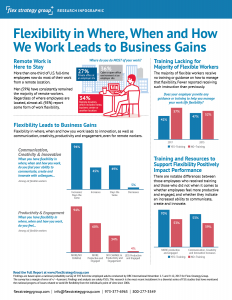 Employees that received flexibility training were more likely to note those positive views. However, despite widespread availability of collaborative technologies that improve efficiency, most employees (65%) go old-school using email, spreadsheets and word documents as their “frequently” used tools to update supervisors and colleagues about work progress and performance. Only 17 percent noted frequent use of video/web conferencing and just 8 percent frequently used cloud-based project management software. This research is the most recent installment in a biennial series of FSG studies that have monitored the national progress of issues related to work life flexibility from the individual’s point of view since 2006. The most recent survey was conducted November 2-5 and 9-12, 2017 with a margin of error of +/- 4 percent. A summary report with additional data, organizational assessment and infographic are available at www.flexstrategygroup.com.